Here's a little something that I threw together with some lamb chops that I bought during my trip to the Covered Market in Oxford. There's something special about it when the butcher cuts the chops freshly for you. It sure beats buying something from the supermarket that's been cut and stored for longer than you dare to think of. I'd normally fry these for about 5 - 7 minutes (tops) on each side. However, if you and/or your guest are a bit sensitive about blood in your food you might want to have the oven on standby at about 200c. Once you've fried them so they have a nice surface you can put them in the oven until cooked to your liking. That way you protect them from looking cremated while still cooked all the way through. Cover both sides of the chops in Dijon mustard and pat in liberal amounts of oregano. In the meantime rinse the spinach thoroughly under the tap and shake it to discard most, but not all, of the water. Close to the resting time put the spinach, together with the garlic slices, into a hot pan and cook whilst stirring until wilted to your liking. Season to your liking. 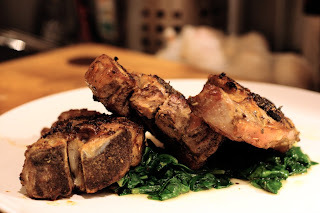 Serve the lamb chops on top of a bed of wilted spinach on warm plates. Serve the mash in bowls on the side. I am always looking for different ways to make pork chops other than inthe crock pot with saurkraut. Haha. Using mustard works fine for pork as well as lamb chops.